LHF in Ukraine: "We wanted Luther to speak Ukrainian!" The collapse of the atheistic Soviet Union was the first great miracle of God that I had the privilege to witness. The resurrection of the Ukrainian Lutheran Church was the second great miracle. For these miracles I continue to thank our Lord. After the fall of the Soviet Union in 1991, what a joy it was to celebrate the first public worship services without fear of being persecuted! As Lutherans, we had very big challenges. We had no theological materials. No Small Catechisms, no hymnals, no Confessions, nothing. Baptists, Pentecostals and Russian Orthodox had their books – Lutherans did not have them. Baptists, Pentecostals and Russian Orthodox were allowed to exist in the Soviet Ukraine. Lutherans were banned. We lacked everything, especially good theology. It was a pure blessing for me and other Lutherans from Ukraine to be invited to study in the summer of 1994 at Concordia Seminary in St. Louis. It was a double blessing to meet Rev. Robert Rahn and ask him to help Lutherans in Ukraine with good, confessional Lutheran books. 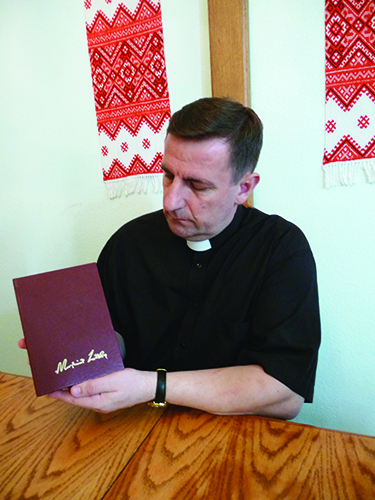 Bishop Slavik Horpynchuk of the Ukrainian Lutheran Church holds a Ukrainian translation of Luther’s Works on the book of John. Rev. Rahn impressed me with his commitment to the Lutheran Church and Lutheran doctrine, his deep theological knowledge, his kindness and optimism and his care about Lutherans in other parts of the world. He immediately came to help and suggested that we start with a booklet called Good News About Jesus. It was published in 1995 in Ternopil and then Luther’s Small Catechism and the Augsburg Confession followed. Now Ukrainian Lutherans had some basic books for a good beginning! We ran out of books very quickly because the demand was so great. There was hunger and thirst for good Lutheran books that provided real theology and not some fancies of men. Rev. Rahn and other staunch Lutherans would regularly come to Ukraine in those days. Those trips were long for them, and I may assume very tiresome for Dr. Rahn and his U.S. team, for after Ukraine they would go to other countries with struggling Lutheran churches. It was very refreshing to us and very encouraging to meet those men and talk to them. After such visits we wanted to have the Book of Concord in Ukrainian and we wanted Luther to start speaking Ukrainian. What started as blessing continues as a blessing! Rev. Matthew Heise encourages us to continue the good work. And now we have 5 volumes of Luther’s Works in Ukrainian to commemorate the 500th anniversary of the Reformation. Today, Luther is known in Ukraine, thanks to the Lutheran Heritage Foundation. But still our people ask for more books! Ukrainians want more Gospel and more Luther, who know Christ best of all. Luther’s teaching makes our churches truly Lutheran and strong in the Word of God. What a blessing the Lutheran Heritage Foundation is for the Ukrainian nation and other nations where it publishes and distributes confessional Lutheran books! How grateful are Ukrainians for your love and commitment to the Lutheran doctrine and Evangelical Lutheran Church!